UPDATE 11/10/16: We are no longer accepting applications for the 2016-2017 season. Thank you to everyone who applied! Do you like spending time outdoors? Would you like to learn more about bald eagles and salmon in the Pacific Northwest and share that knowledge with visitors to our area? If that sounds like you, then you would make a great volunteer for the Skagit Eagle Watchers program with the US Forest Service. If you are interested in volunteering, look for the application form on the top of this page, or call the Mt. Baker Ranger District at 360-856-5700 for more information. Eagle Watcher Volunteers on training day 2011 on the Cascade River near Marblemount Fish Hatchery. Do you like spending time outdoors and meeting new people? 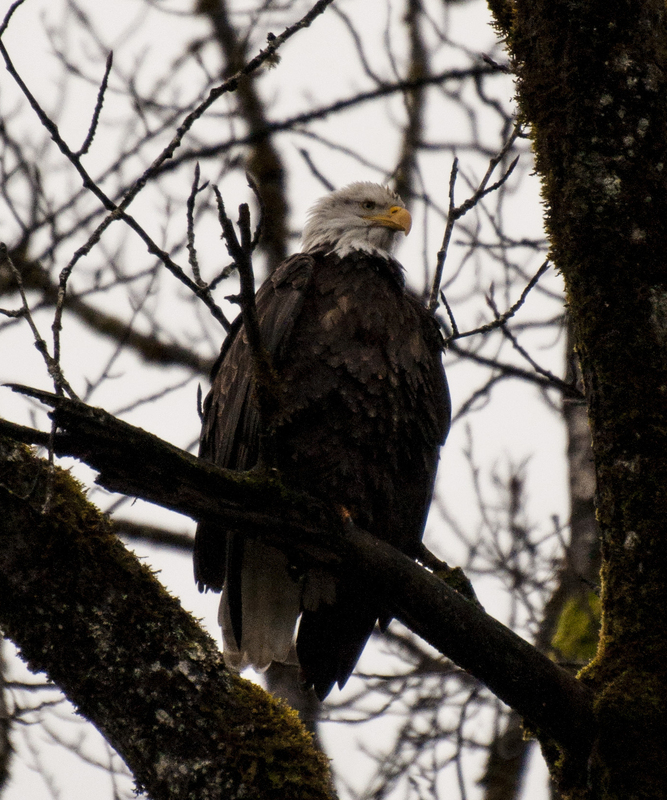 Would you like to learn more about bald eagles, salmon, the Skagit River and the North Cascades? Do you enjoy winter birding, and sharing what you have learned with others? 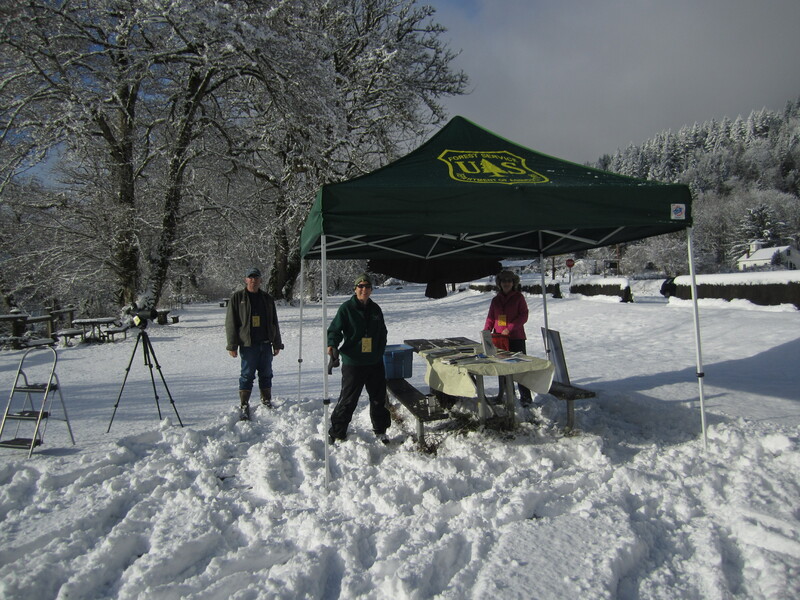 The Forest Service is looking for adult volunteers for our winter volunteer stewardship program. Volunteers staff information tents near eagle viewing areas on the Skagit River, and we get to look at eagles through spotting scopes and binoculars all day. Volunteers can also give nature walks or even formal programs if they have the desire to do so. You don’t have to know anything about eagles, we will teach you. All you need is a friendly attitude and the desire to talk with the public. This program has been going for 21 years and we would love to see some new faces this year. Volunteer solo or with a friend or relative. The application and more information can be found using the tabs above. I will be in the office beginning November 10 and can be reached at (360)854-2630 if you have more questions. Eagle Watcher Volunteers at Milepost 100 on Highway 20, January 2012. Great news, Skagit Eagle Watchers! 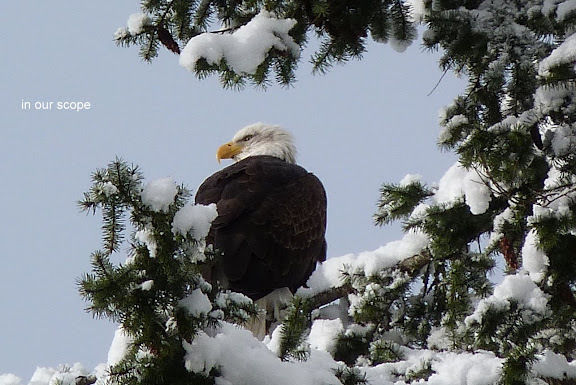 Our favorite eagle viewing site, Sutter Creek Rest Area (AKA Milepost 100) will be available for use this winter. Original plans were that a Skagit River restoration project and resulting road construction were going to close the rest area all winter while contractors used it as a staging area for heavy equipment. Our sources at the DOT now tell us that in fact, the site will remain open to the public until February. Come see us on the river this winter on weekends between December 21-January 26. Take a look through the spotting scope or borrow a pair of binoculars. Interested in volunteering? We still have room for a few more applicants! Click on the 2013 application tab above. Eagle in our spotting scope, Howard Miller Steelhead Park, Rockport, WA, January 2012. Photo by Don Knutzen. 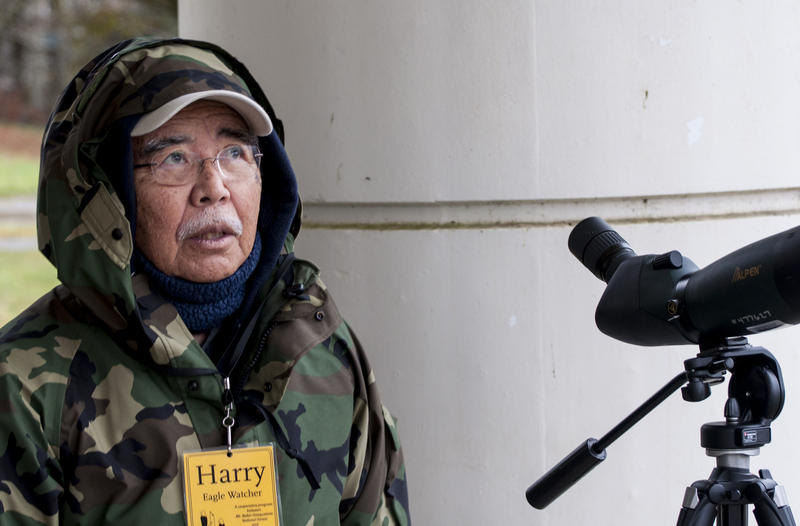 The Forest Service can still take a few more volunteers into the Skagit Eagle Watcher program this winter. I have extended the deadline to Wednesday, November 21. 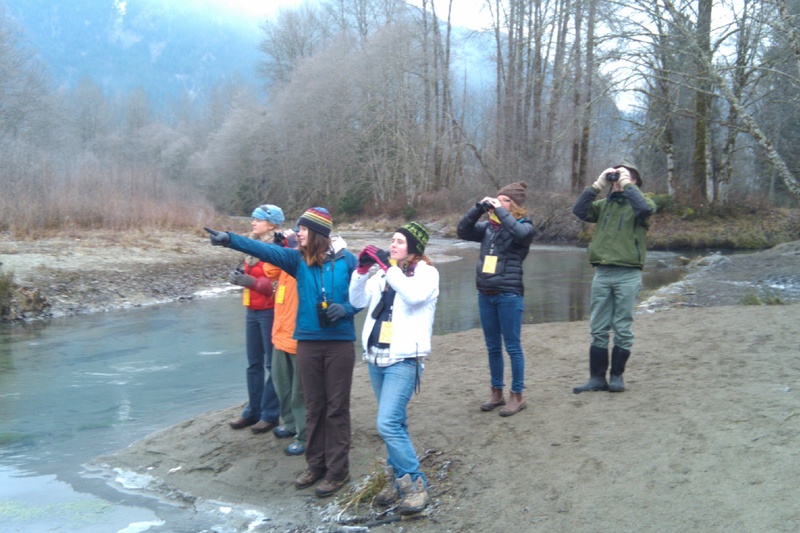 Volunteer participants receive training on December 1st and 15th, then spend a few weekends out on the Skagit River looking at eagles and answering questions for the public. Interested? Fill out an application form here (see the tab above) or call the Mt Baker Ranger District for more information at 360-856-5700.